Morocco's Noor I solar power plant near Ouarzazate currently powers over 100,000 homes in the country. Springing up on the edge of the Sahara desert are rows of curved mirrors as far as the eye can see. They're part of what could become the biggest solar power plant in the world. Morocco is investing about $2.6 billion on the construction of the Ouarzazate complex, which forms the heart of a $9 billion strategy to harness one of the country's greatest natural resources -- sunshine. When completed in 2017, it will cover an area nine times the size of New York's Central Park and generate enough electricity to power about one million households. 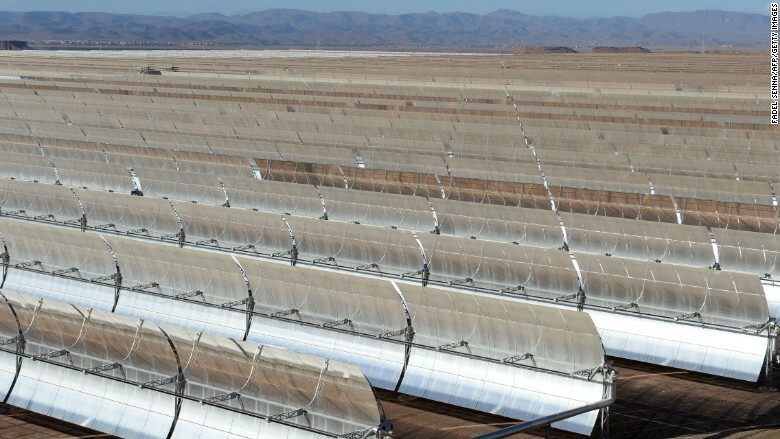 The first phase was officially opened last month, and a further three linked plants will come online by the end of next year, according to the president of the Moroccan Agency for Solar Energy, Mustapha Bakkoury. "It's very impressive," Bakkoury told CNNMoney. "You cannot see the end of the [solar] mirrors." Morocco has been developing solar and other sources of renewable power for years. It has just set itself the ambitious target of meeting just over half the nation's electricity needs from renewable power by 2030. It's trying to wean itself off imported fuel, and reduce emissions at the same time, said Bakkoury. Morocco is using solar technology that operates very differently from traditional solar panels, which use photovoltaic cells to convert sunlight directly into electricity. The Ouarzazate complex uses large curved "mirrors" that track the sun like flowers and channel radiation to generate steam inside a network of tubes. The steam drives a central turbine that generates electricity, which flows into the national grid for use by Moroccan homes and businesses. Perhaps most impressive is that the complex can continue to operate after the sun sets. Heat from the system can be stored for hours in tanks filled with molten salts. That allows steam to be generated for hours and keep turning the turbine at night. The operational portion of the Ouarzazate solar complex provides 2% of the country's daily power, and the country has a long way to go to hit its targets. But analysts say Morocco has a good track record when it comes to executing on its plans. "I think Morocco should be commended for delivering on its ambition," said Ben Warren, a global power and utilities expert at EY, formerly Ernst & Young. "Other countries have been, to date, noticeable for talking about ambitious renewable plans, but not implementing them." He said Morocco is joining the ranks of solar superpowers alongside the U.S., Chile and South Africa. Power usage in the country is growing at a rapid rate and infrastructure has to keep pace. Bakkoury expects national power consumption will double in 10 years. The ability to store power for hours at a time is crucial for a country such as Morocco because usage peaks after the sun goes down, he added.